Love this thread! Funny y'all should mention picking teams...during one of the games last weekend my stepson asked what team was I pulling for...and I was clueless. Don't remember ever having this problem before...all the teams I root for were decided when I was really young. I never watched the USFL or XFL at all really. So I get sdskinsfan going with the local team, but for us who don't have one near, how you picking a team? Or are you? I did kind of dig the Iron uniforms also...as well as the name. 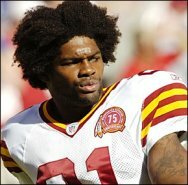 As a Skins fan you could roll with the Hotshots because of Ross...any other Redskins playing with anyone? I just watch, and then see which way I find myself leaning. Some players or coaches will jump out as likable or unlikable, and if you just let it come naturally before you know it you'll be rooting for somebody. It's kind of like when the Skins get knocked out of the playoff hunt (often) you get naturally drawn to a certain team. In previous years for me it's been Aaron Rodgers but this year for me it was Phillip Rivers. Does ESPN even have any information for the league on their site? Not much it is usually on the NFL pages, check out CBS sports website. The Skins really fucked over the Fleet. They picked JJ # 1 overall and then we signed him. So he isn't on the Fleet now and their QB just threw one of the worst INTs I've ever seen. I'm watching a high scoring soccer match. 9-9. Fleet need JJ. Him winning against Jacksonville now contributes to Fleet being allergic to the endzone and he costs us like 8 draft slots. Note - I'm glad we beat Jacksonville. I like winning and it was amazing for JJ. This league must be sponsored by NFL because the refereeing is ruining games. There is indeed legit concern that they will not survive past the season. Had it not been for the hockey owner, the league would have folded shortly after week 2, is what the speculation says. I guess i will never understand how these things are not thought out / planned, like how much money they would need, etc. Although did you see the attendance at the Memphis game? Not good. My team is San Antonio because every time I've been to SA its been a lot of fun.